Keeping up with the trends can be a tough job so why not stay with a timeless interior design that can stay forever? There’s a lot of interior design firm that can turn a living room, bathroom, kitchen, and bedroom into a beauty. But it is not always the option right? as most of us loves to do it ourselves. We can say that creativity comes from inspiration, so anyone aspiring to make their home lovely, functional and comfortable can read these guidelines. The less crowded the more elegant it will look! 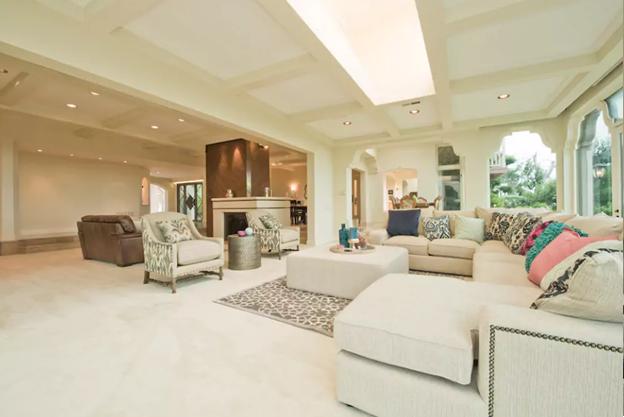 Yes that is the concept of this interior design; an aesthetic living room with open large ocean windows that invites the breeze and natural light inside the house, and a high ceiling finish that looks spacious and comfortable. White and a bit of dark color goes hand in hand to create a relaxing ambiance complimented by the white Lawson-styled sofa set and brown leather sofa close to the hearth. Pay attention on how the interior designer minimized the number of furniture without jeopardizing the functionality of the room; the furniture is also placed proportionally occupying less space to prevent the living room look crowded. Wall paints, colors and lightning also play a great role. Pure white will look bland and lifeless so add a color to the room; minimize the color inside to prevent the room from looking like a children’s playroom. This is achieved by choosing the right furniture color, wall paints and accessories like what it shown in above picture. Yellow lightning compliments the white wall while choosing the right color for accessories like side tables, pillow cases, and paintings can make the room stunning and unique. This room is a classic example of functionality and simplicity with a character. 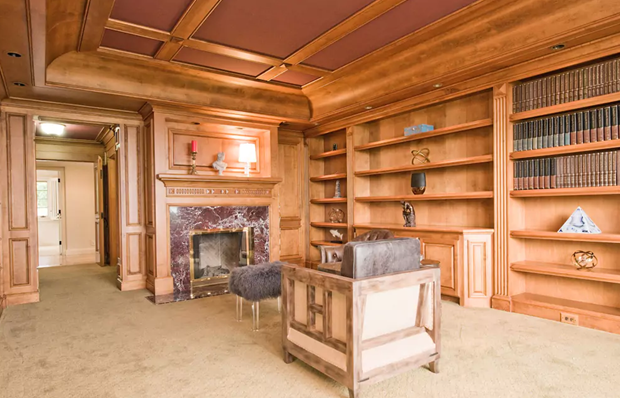 An elegant library and office room with a hardwood ceiling, wall, and shelves which is a perfect place if someone just wants to get lost in thoughts while reading his or her perfect book, or maybe doing some office work while sitting in a traditional chair. An elegant fireplace with glass panel doors and maroon marble finish for the cozy ambiance, and accessories situated elegantly on the shelves. The quality of the furniture, accessories and even the hardwood finishes are carefully chosen to avoid conflict with the design and ensure that the functionality of the room is granted. Getting more accessories like paintings, lamps, figurines just for the sake of stuffing it is not a good idea for it will just look overwhelming and messy to the eyes. Adding furniture and accessories should always compliment the concept of the room and it should always be in high quality. You can never go wrong with a timeless interior design however it does not apply in most cases; to add character to the room, you can get trendy items that can easily be replaced like for pillow cases, fabrics, displays, and curtains etc. Just make sure not to mess up the theme you had in mind.